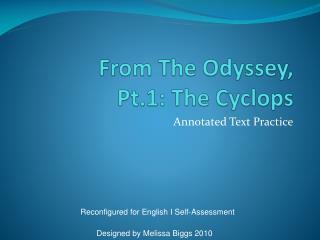 Odysseus and the Cyclops. The wind howled as the small crew approached the tiny island. A horrible smell loomed in the air as storm clouds gathered around. It was as if the Gods themselves were warning them not to enter. The wind howled as the small crew approached the tiny island. A horrible smell loomed in the air as storm clouds gathered around. It was as if the Gods themselves were warning them not to enter. 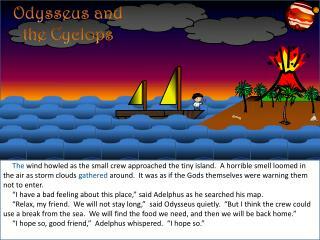 “I have a bad feeling about this place,” said Adelphus as he searched his map. 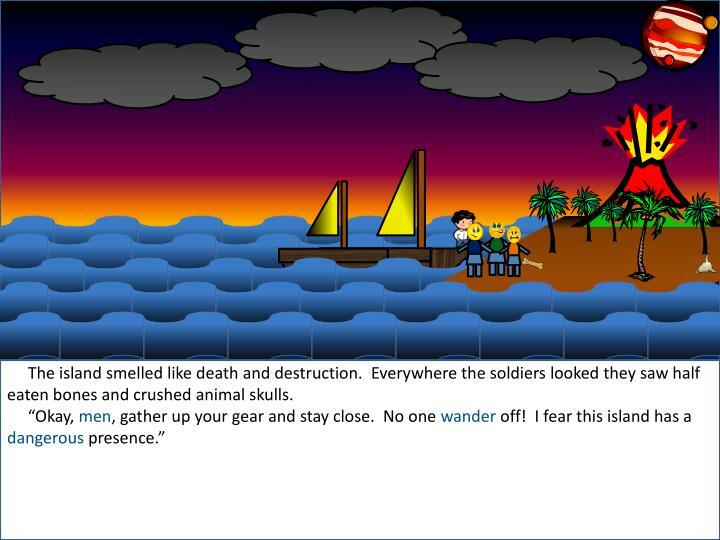 The island smelled like death and destruction. Everywhere the soldiers looked they saw half eaten bones and crushed animal skulls. Lightning shot across the sky and illuminated everything like a giant fireball. Jace screamed out in fear. The men scrambled into a nearby forest where suddenly they found a clearing. 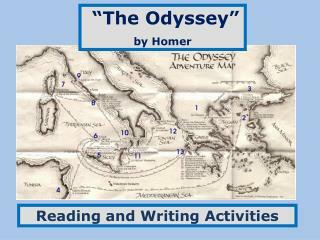 “Look, Odysseus! Inside that mountain!” yelled Adelphus. 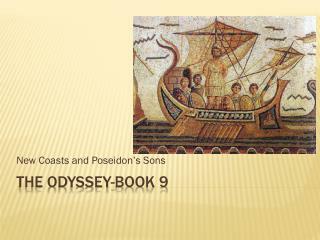 Odysseus and his crew ran as quickly as they could just as the storm clouds burst and sent down a torrential rainstorm. 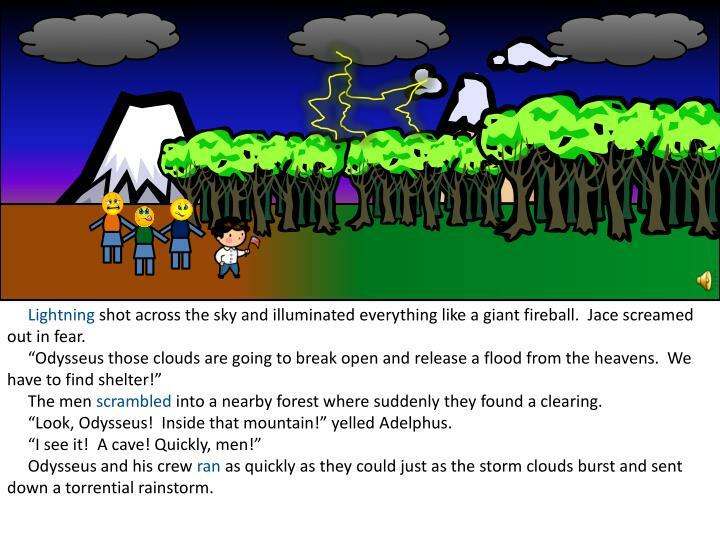 As the lightning struck and the thunder roared, the tired men stumbled into the dark cave. The smell of rotten meat wafted throughout the cave. 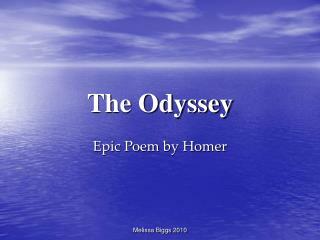 Odysseus walked over to his best friend, his eyes wide with fear. “These look like human skulls,” he whispered. Suddenly, the ground began to shake and high-pitched screams were heard as thirty dirty sheep flooded into the cave behind them. 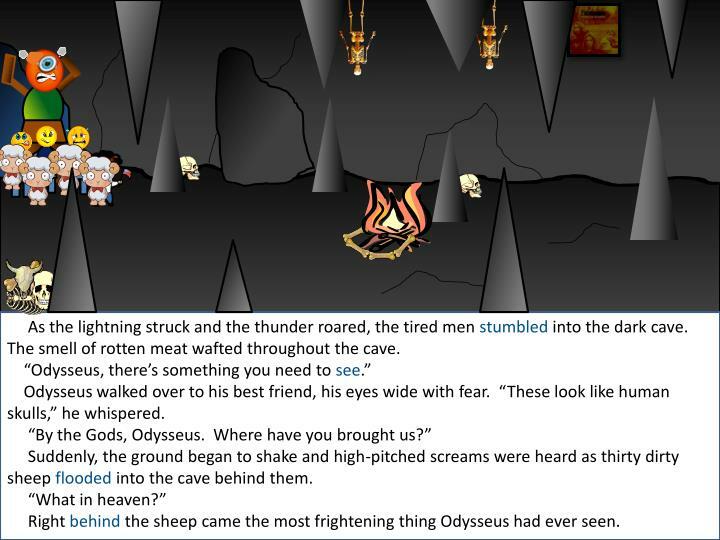 Right behind the sheep came the most frightening thing Odysseus had ever seen. 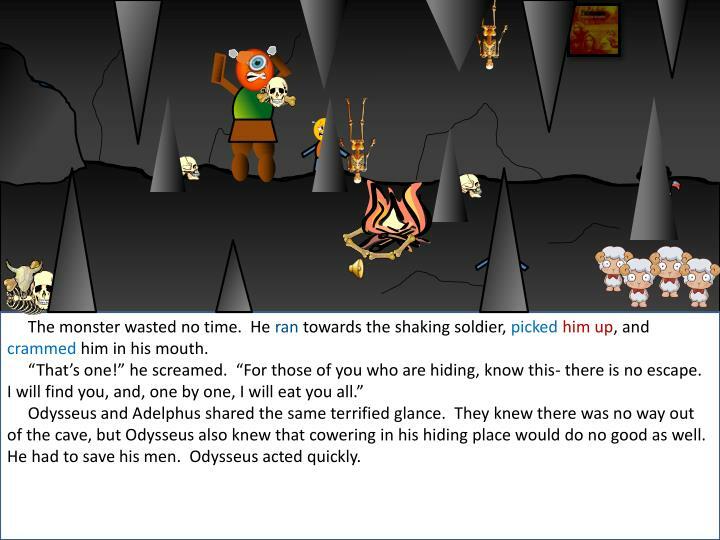 “Everyone hide!” Odysseus screamed as he ran behind a stalagmite. 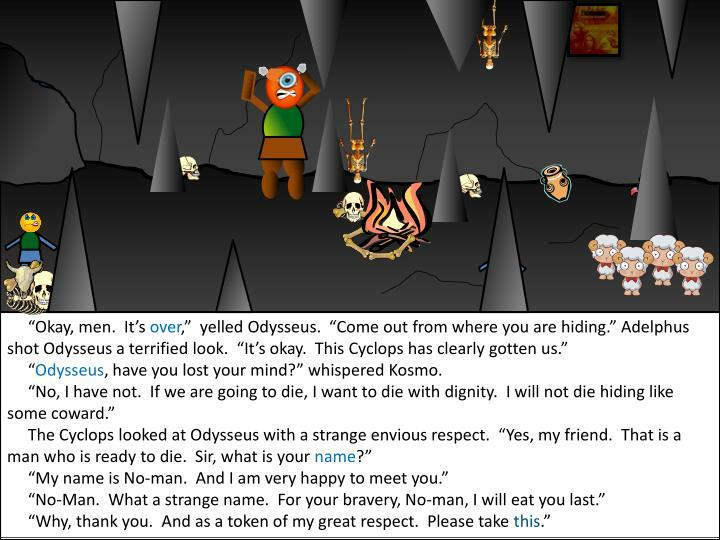 The Cyclops entered the cave. He was a huge hideous monster with orange skin and one gigantic eye. 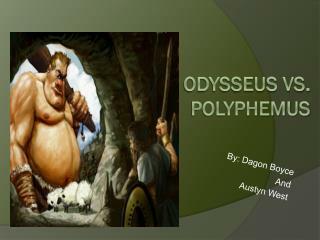 Slowly, the Cyclops wandered around his home, sniffing and smelling, trying to find the intruders. Jace was terrified. He tried to control his shaking, but soon he was overwhelmed with fear. The loose rocks behind his back started to rattle. Suddenly, a skeleton hanging on the wall behind him broke free and crumbled to the ground. The monster wasted no time. He ran towards the shaking soldier, picked him up, and crammed him in his mouth. 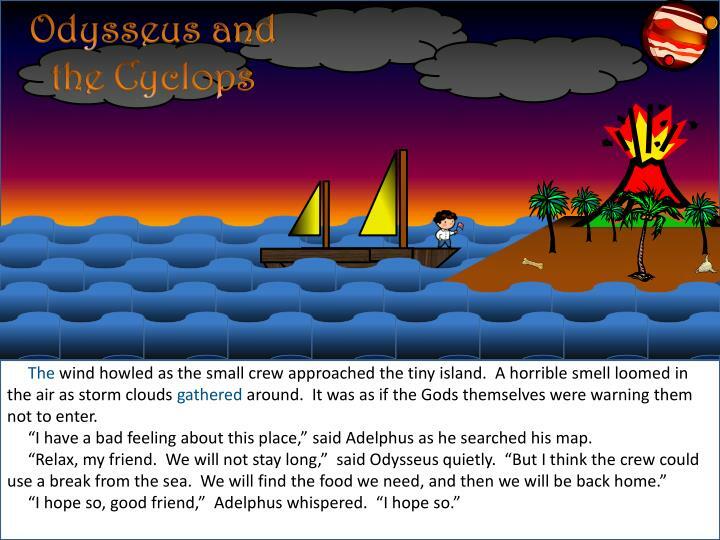 Odysseus and Adelphus shared the same terrified glance. 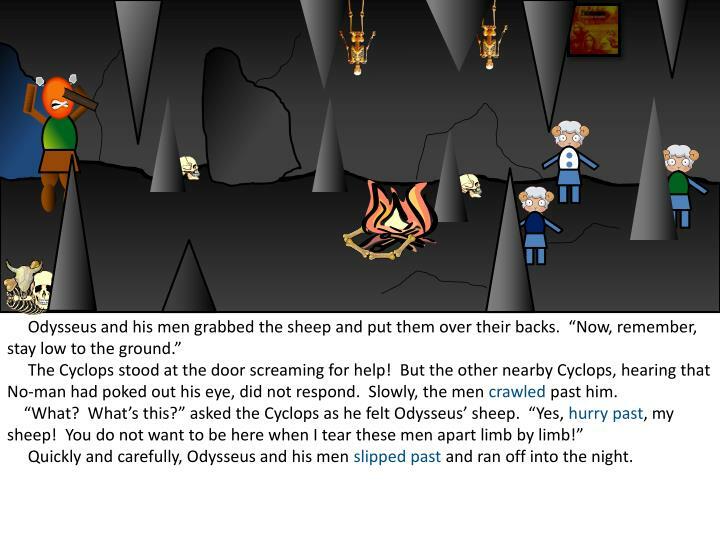 They knew there was no way out of the cave, but Odysseus also knew that cowering in his hiding place would do no good as well. He had to save his men. 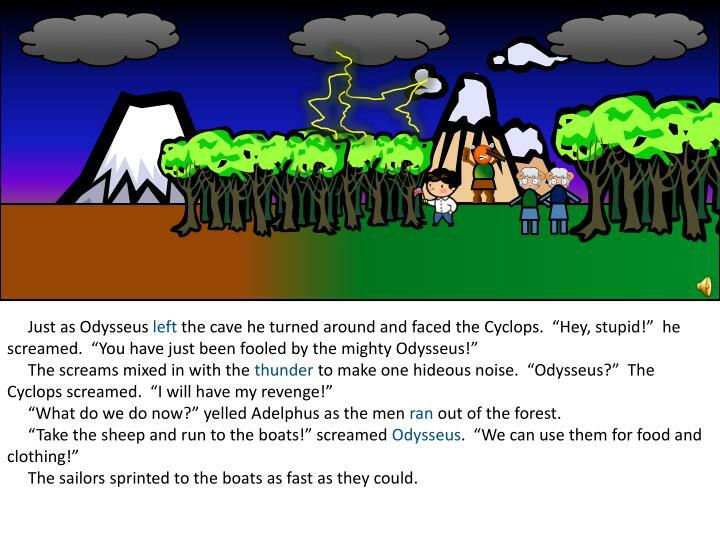 Odysseus acted quickly. 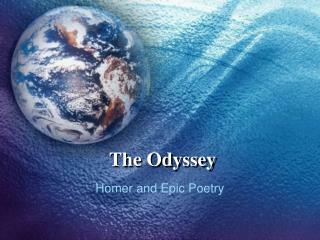 “Odysseus, have you lost your mind?” whispered Kosmo. 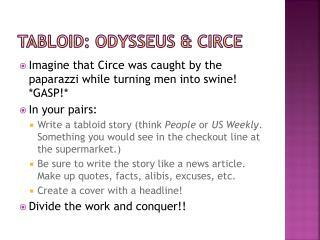 Odysseus reached into his bag and handed the Cyclops a single jug of wine. But it was no ordinary jug. 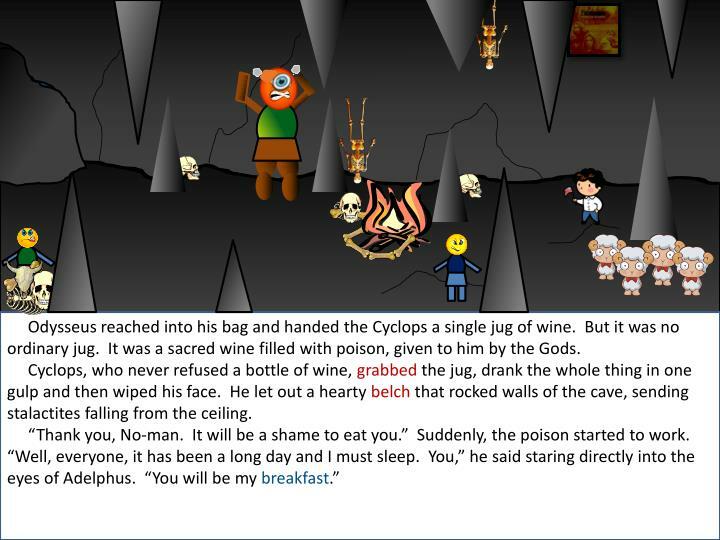 It was a sacred wine filled with poison, given to him by the Gods. 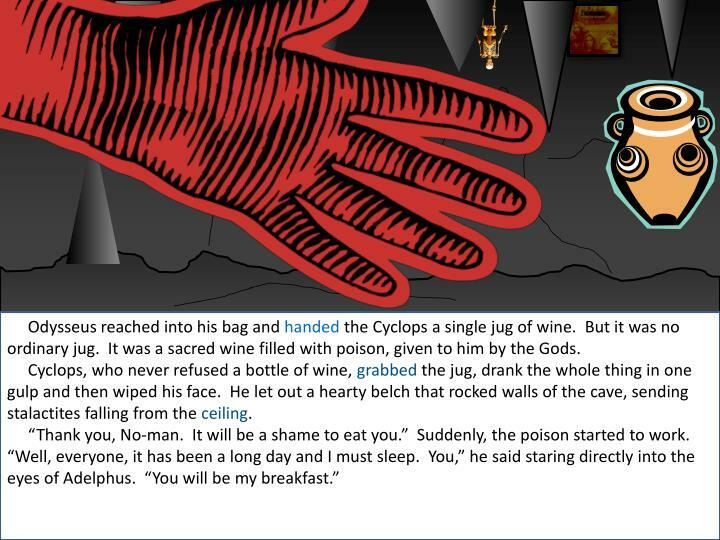 Cyclops, who never refused a bottle of wine, grabbed the jug, drank the whole thing in one gulp and then wiped his face. 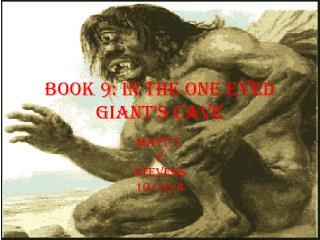 He let out a hearty belch that rocked walls of the cave, sending stalactites falling from the ceiling. 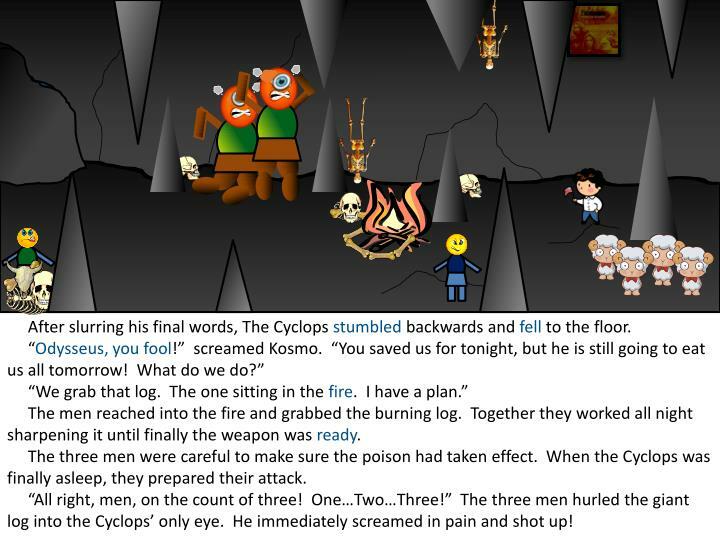 After slurring his final words, The Cyclops stumbled backwards and fell to the floor. The men reached into the fire and grabbed the burning log. Together they worked all night sharpening it until finally the weapon was ready. The three men were careful to make sure the poison had taken effect. 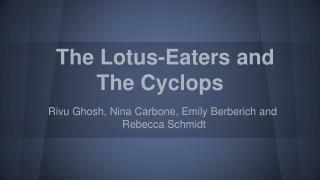 When the Cyclops was finally asleep, they prepared their attack. 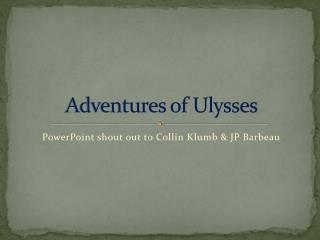 “All right, men, on the count of three! 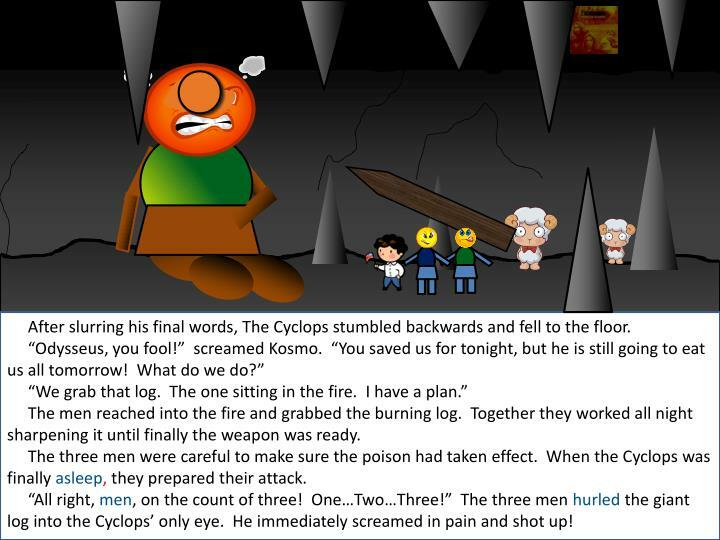 One…Two…Three!” The three men hurled the giant log into the Cyclops’ only eye. He immediately screamed in pain and shot up! 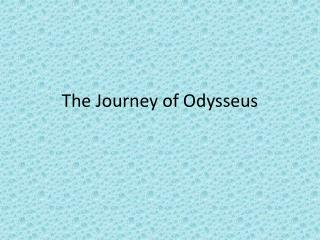 “Well, if no man has poked it out, then why are you screaming?” laughed Odysseus. 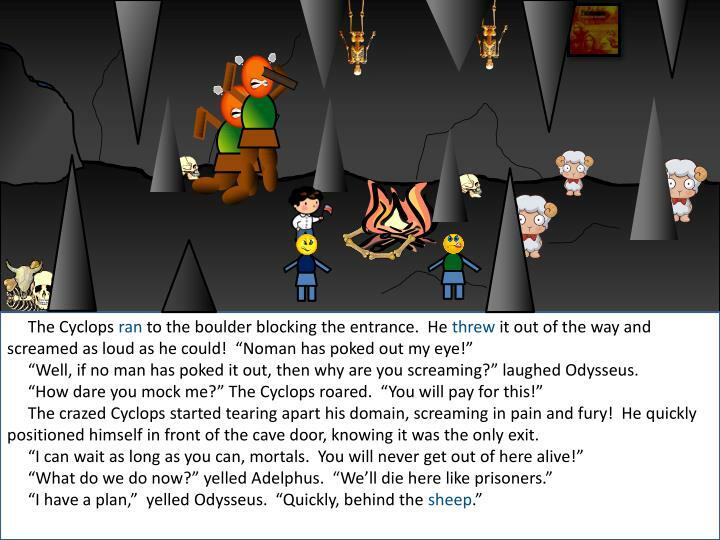 “How dare you mock me?” The Cyclops roared. “You will pay for this!” The crazed Cyclops started tearing apart his domain, screaming in pain and fury! He quickly positioned himself in front of the cave door, knowing it was the only exit. The Cyclops stood at the door screaming for help! 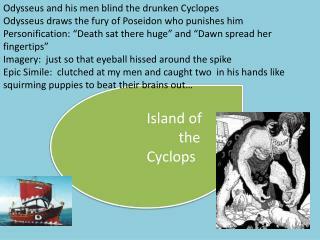 But the other nearby Cyclops, hearing that No-man had poked out his eye, did not respond. Slowly, the men crawled past him. 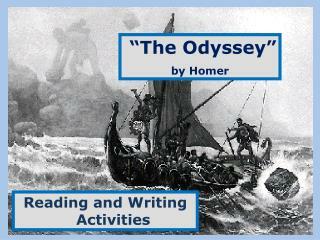 Quickly and carefully, Odysseus and his men slipped past and ran off into the night. “What do we do now?” yelled Adelphus as the men ranout of the forest. The sailors sprinted to the boats as fast as they could. 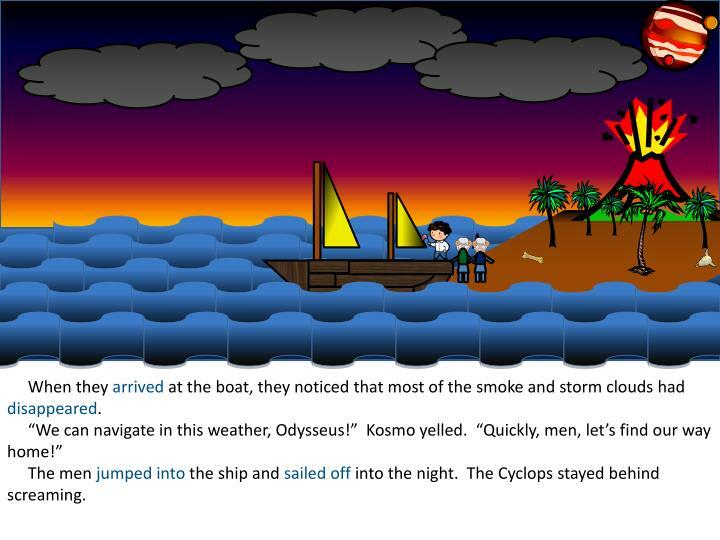 When they arrived at the boat, they noticed that most of the smoke and storm clouds had disappeared. The men jumped into the ship and sailed off into the night. 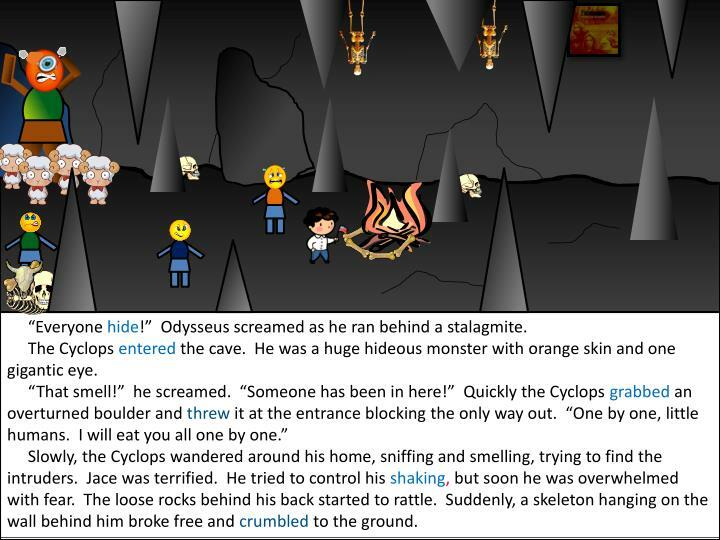 The Cyclops stayed behind screaming. 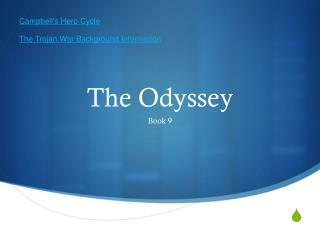 in the Cyclops ’ cave, Odyssey 9.360 - 420 -. Οὖτις. greek has two ways of saying “nobody”. 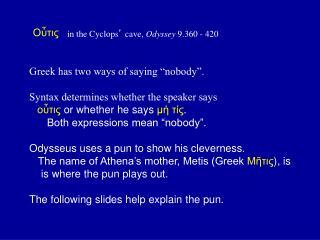 syntax determines whether the speaker says οὖτις or whether he says μή τίς . both expressions mean “nobody”. 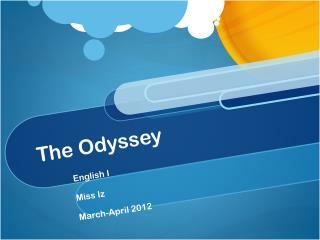 The Odyssey -. 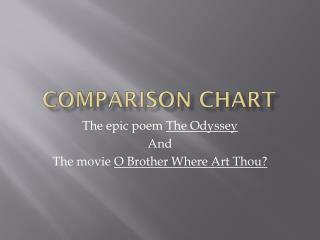 homer and epic poetry. 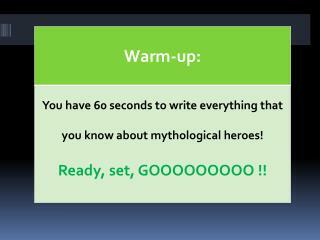 mythology. storytelling. 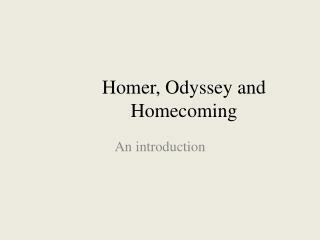 homer. 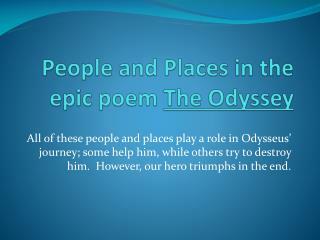 blind greek poet and storyteller wrote/told: the iliad the odyssey written down years later after his death. 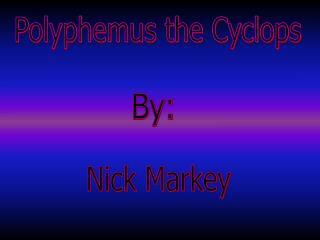 Polyphemus the Cyclops -. by:. nick markey. about the sculpture. made in the late hellenistic or roman period about 150 b.c. height: 38.3 cm made of marble broken off at the neck from a collection when odysseus blinded the cyclops.